Activity takes about one-two class periods and homework assignments. Computer access required. Providing learners with appropriate data sets for this or other regions will help them gain a quantitative handle on the topic of climate change and freshwater resources. Because of the length of the activity, it could be used as an entire unit on the Colorado River watershed or customized for other watersheds. Students research the impact of climate change on the Colorado River Basin by analyzing snowpack data sets and satellite images of land and vegetation. Some data sets and images are presented to support the activity, source citations are not available. Comments from expert scientist: Addresses key issues of water quantity across Colorado River Basin and potential impact based on historical changes. Need to address potential water quality concerns as CRB also serve for drinking water supply. 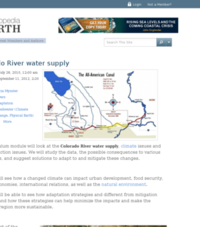 This is a structured, problem-based learning module using the impact of climate change on the water levels in the Colorado River Basin and as a case study. The authentic final assessment asks students to use their research and analysis of data and images to suggest revisions to the 2007 Colorado Basin water allotment agreement. Activity provides background information and guiding questions for students to work through the data. Instructors may want to customize this activity for their own area of interest and assessment needs. Teacher notes are not included because this is a college-level module and thus assumes the expertise of the professor. However, the four parts of the module are scaffolded enough to enable 11th and 12th grade students to successfully use the module. HS-ESS3-1:	Construct an explanation based on evidence for how the availability of natural resources, occurrence of natural hazards, and changes in climate have influenced human activity. HS-C3.1:The significance of a phenomenon is dependent on the scale, proportion, and quantity at which it occurs. HS-C3.3:Patterns observable at one scale may not be observable or exist at other scales. HS-P1.1:Ask questions that arise from careful observation of phenomena, or unexpected results, to clarify and/or seek additional information. HS-P3.5:Make directional hypotheses that specify what happens to a dependent variable when an independent variable is manipulated. HS-P6.2:Construct and revise an explanation based on valid and reliable evidence obtained from a variety of sources (including students’ own investigations, models, theories, simulations, peer review) and the assumption that theories and laws that describe the natural world operate today as they did in the past and will continue to do so in the future.